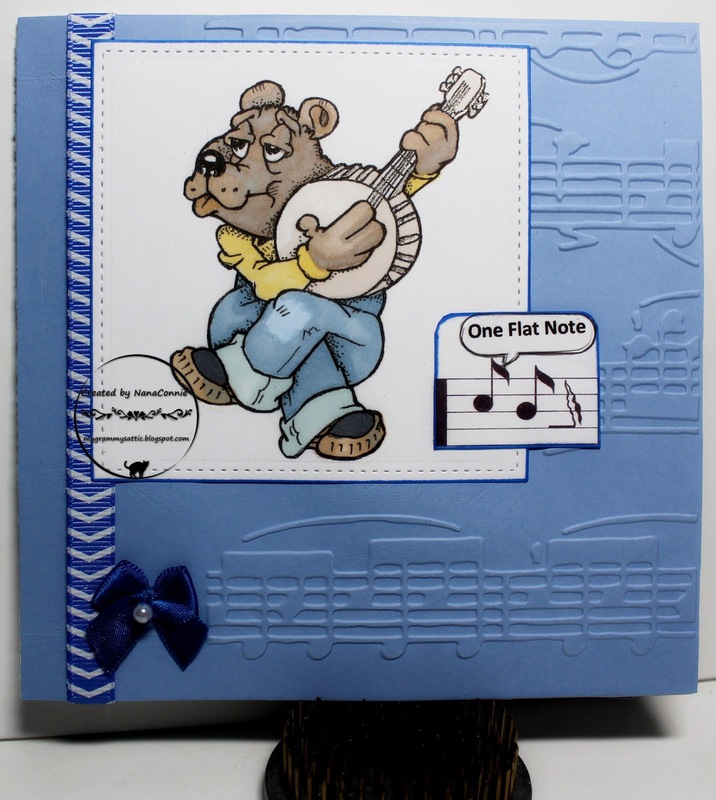 I'm going to use today's card for a masculine birthday card and it showcases another of the QKR Stampede bears I love so much. Our new challenge starts today and this time it truly is "Anything Goes." No optional twist, nothing - just anything you care to submit. The image is called "Banjo Picking" and the sentiment is "A Little Flat" but I changed the actual sentiment inside the text bubble to better fit this card. You can see the original by clicking on the image title above. I colored the image with my ProMarkers and cut it with a square, stitched die from Lawn Fawn. I inked the edges before adhering it to the card. I chose some denim blue CS and ran it through my music embossing folder. Before putting it on the card front, I wrapped chevron striped ribbon to it and then added the image on top of that. A small blue bow with a pearl finished it off. Nothing too fancy for a masculine card. I love making cards because it both relaxes me while I'm crafting and allows me to express my creativity. To be able to do masculine cards (something I truly love, unlike many crafters) means that I always have something for a guy that I can grab, even at the last minute when there's no time to get a card made! Oh this is fabulous. 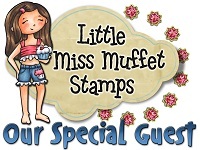 Love the embossed background which is just perfect with your gorgeous image. Lovely work. Back again, and again, love this. Nice work. I did laugh at this, love the card and the embossing and your colouring, fabulous. Wonderfully designed card. I love all the elements you have use, they fit the theme so perfectly. Thanks for joining us at AULI Challenge! This is just too cute Thank you for sharing with us over here today at the Classic Open Design Team Challenge and best of luck with your entry. So adorable. Great coloring and love the music notes. Thanks for joining the DL.ART THANKFUL THURSDAY 205 challenge boys or/and men.have a blessed day DIANA L.
Super cute! Love the image. Thank you for sharing with us over here at Classic Design Team Open Challenge and best of luck with your entry. Lol, this is fabulous, love! Thank you for sharing with us over here at World Wide Open Design Team Challenge and best of luck with your entry. Love the image and your fab colouring, another wonderful masculine card. Neat embossing too!